Rubio quits. Kasich wins Ohio. Cruz holds on. But it is still Donald’s night. It was around 9 p.m. on a primary night, and, lately, you know what that means: time for Donald Trump to call a press conference at his gilt-ridden Mar-a-Lago resort compound—and for networks to preempt all their other primary night programming to cover it. On so-called Super Saturday, March 5, as well as last Tuesday, Hillary Clinton and Bernie Sanders were having races called for and against them—meaning actual news was breaking—but the cameras stayed on Trump (the crawl below was left to announce new developments). Tonight, I found myself wondering if networks might break into Trump’s “press conference,” if and when Senator Marco Rubio dropped out. But not to worry: Rubio announced he was suspending his campaign—in a bizarre, self-congratulatory, and self-contradictory speech—more than an hour before Trump took his stage. Once again, Trump won the big delegate haul. But once again, the hopes and dreams of the erstwhile GOP establishment hang on another man. This time, it’s Governor John Kasich, who won his home state of Ohio. Back in the day, winning your home state was next to meaningless, unless it came alongside other victories. In Trump’s GOP, it makes you the only game in town. Rubio, of course, lost his home state of Florida badly, and thus came out early to bring his campaign to an end, long before Trump could belittle him again. He might have won one heavily Cuban precinct in Florida, networks said. His goodbye speech was rambling, occasionally moving, and mostly clueless. He blamed the GOP establishment for the rise of Trump—the same establishment that fought so hard for him, throwing an estimated $13 million in Florida against Trump in the last month without even mussing Trump’s Cheeto-coated hair. Rubio told a moving story of his grandparents going hungry so his parents could eat, which helped me finally understand why his tax plan cut capital gains to zero. Oh, wait. No, it didn’t. 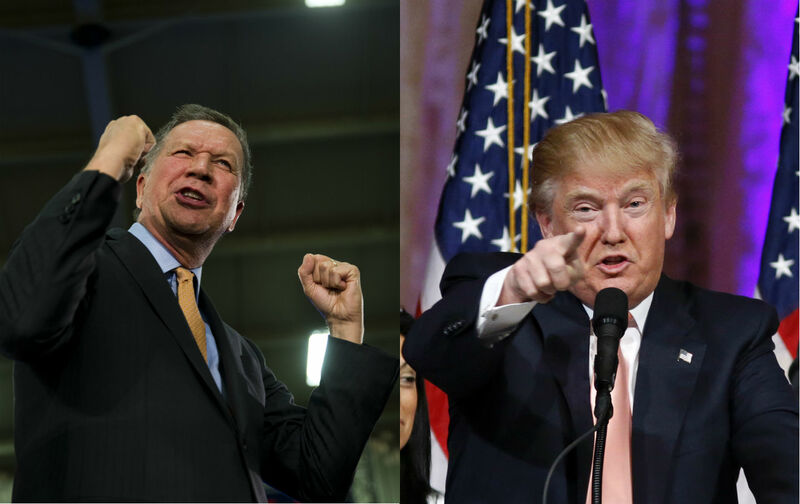 Kasich’s win, though, has newly emboldened the anti-Trump forces. MSNBC’s Steve Schmidt, who ran John McCain’s losing campaign, insisted Kasich would now become the repository of the hopes and dreams of decent Republicans, who know deep in their hearts that Kasich is the only one who can defeat Hillary Clinton. Still, tonight, we saw the kind and gentle Kasich, however patriarchal, not the guy who defunded Planned Parenthood, signed a 20-week abortion ban, cut SNAP benefits, and went to work for Lehman Brothers when he left Congress. But the media is desperate for a story line that counters Trump; expect lots of reporters to #FeeltheSich in the next few days. Trump himself was rather restrained Tuesday night, letting both Clinton and Kasich finish their victory speeches before he climbed onto the classy Mar-a-Lago stage. He was boastful and rambling, but didn’t demand that his supporters beat up anyone. Yet, for the first time in memory, he had embattled campaign manager Corey Lewandowski onstage behind him–in the position of honor occupied by New Jersey Governor Chris Christie on Super Tuesday. Lewandowski, of course, is accused of assaulting Breitbart.com reporter Michelle Fields a week ago, which caused the corrupt Breitbart faux-media cartel to collapse into itself. Both men have denied the assault, despite eyewitness and audio and video evidence, which made Lewandowski a menacing presence onstage. But it must be said: No one was actually assaulted tonight—for the first time in a while. Although it didn’t help Rubio, this was the month the establishment finally turned on Trump, and it was almost enough to make one sympathetic to the Queens-born usurper. In fact, two things happened Tuesday that made this Trump-hater root for him a tiny bit, and then catch herself, and return to the correct attitude of revulsion. Mark Halperin, who, thanks to Bloomberg, MSNBC, and Showtime, seems to have the franchise on 2016 campaign coverage, released an awful video of himself slurping martinis with GOP donors and bigwigs, as they expressed their desperation, and their impotence, when it comes to stopping Trump. In fact, the only promising development they mentioned was Republican Katie Packer’s Our Principles PAC, and its compelling ad featuring Trump’s sexism and misogyny, but of course Packer herself wasn’t there; only white men over 60 need apply. “All he has going for him is a lot of votes,” GOP consultant Ed Rogers complained. How illegitimate. The same day, the anti-Trump National Review came up with its answer to the Trump phenomenon: His voters ought to die. No, I’m not kidding. The horrifying Kevin Williamson expressed his elitist revulsion at Trump voters—specifically the white working class, which is better known, and has been for 30 years, as the GOP base—with an unforgettable screed. “The truth about these dysfunctional, downscale communities is that they deserve to die. Economically, they are negative assets.” It’s not entirely unique in the modern GOP—House Speaker Paul Ryan used to divide the world into “makers” and “takers”—but Ryan has mostly learned to leave that language behind. Besides, Ryan never suggested that the takers deserved to die. Then there’s Ted Cruz, whose campaign told reporters that he’d be happy if he woke up tomorrow and had only fallen behind Trump by 100 more votes. He’s gotten used to Rubio declaring victory when finishing third, I guess. Yes, Cruz remains in second place, but he has no momentum, even if he wins Missouri tonight, and he’s widely hated by an establishment, such as it is, that seems happier to line up behind the everyman oddball John Kasich. Expect the media to give Kasich more attention too. But don’t expect them to abandon Trump. I’ve been thinking about the things that make this year different from 1968, the year Richard Nixon prevailed after two terms of Democratic presidents, with years of pent-up frustration exploding in the streets. There were many differences, of course. But one advantage Trump has over Nixon: He drives ratings. The networks love him. Nixon never drove ratings. The man whose presidential hopes famously tanked in 1960 against John F. Kennedy, because of his awful TV visage; the man with the 24-hour 5 o’clock shadow, whose nasal honk and cramped, crabbed mien made him hard to look at on the small screen; the media never identified his popular fate with their own. Even Roger Ailes couldn’t help him much. Trump has so much momentum as a story line, as a protagonist; even with a media boost on behalf of Kasich, in the interest of a horse race, which is something journalists always root for, I don’t see Kasich catching the front-runner.